This position resides with the New Mexico State Library – Rural Bookmobile East in Tucumcari, New Mexico, delivering library services to rural and underserved communities in eastern New Mexico. 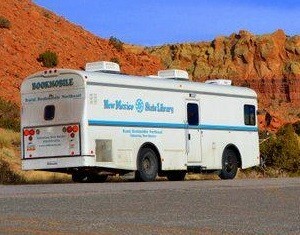 Employee supports all aspects of these services, both on the Bookmobile and in the Tucumcari office. Employee is required to travel overnight two (2) to three (3) nights during two (2) to three (3) weeks of the month. All performance and assignments will follow the Bookmobile East Guidelines and Rural Services Procedures Manual. This position will not be paid above the mid-point of the Pay Band. This position is a Pay Band 45. High School Diploma or GED and one (1) year of relevant experience. Successful candidate must complete state offered Defensive Driving course prior to operating a state vehicle. Must possess and maintain a current and valid Driver’s License. Successful candidate will be subject to a background check. Employment is subject to a pre-employment background investigation and is conditional pending results. Do you know what Total Compensation is? Employee is required to travel overnight two (2) to three (3) nights during two (2) to three (3) weeks of the month.Two (2) or three (3) day long bookmobile trips per week result in work schedules that often exceed eight (8) hours per day. Exposure to Visual/Video Display Terminal (VDT) and extensive personal computer and phone usage. Some sitting, standing, bending and reaching may be required. Working Conditions for individual positions in this classification will vary based on each agency’s utilization, essential functions, and the recruitment needs at the time a vacancy is posted. All requirements are subject to possible modification to reasonably accommodate individuals with disabilities. Exempt. FLSA status may be determined to be different at the agency level based on the agency’s utilization of the position. This position is covered by a collective bargaining agreement and all terms/conditions of that agreement apply and must be adhered to. Deanne is the Youth Services & Outreach Consultant for the New Mexico State Library.